Ever since states mandated the Praxis Principles of Learning and Teaching (PLT) K-6, teacher candidates have worried about passing it. The Praxis PLT K-6 (5622) is a high-stakes test that covers the CONTENT of EVERY EDUCATION COURSE YOU EVER HAD! If you fail it, you waste time and money, delaying your first day of teaching. Lucky for you, PLT K-6 test-takers have shared their Praxis study methods. Learn from their mistakes! If YOU don’t want to experience the frustrations of these former test-takers, use their experiences to overcome the obstacles that may be in YOUR way. First, review WHAT IS ON the exam by going to the official ETS website. Second, use a top Praxis PLT K-6 study guide to master the content. Third, leverage Praxis PLT K-6 practice test questions to improve your ability in HOW TO TAKE the exam and HOW TO PASS. If you TAKE THE TIME to overcome these obstacles NOW, YOU will pass the first time! Praxis PLT K-6 Step #1: Know What’s On The Test? The Praxis Principles of Learning and Teaching Exam K-6 (5622) tests pedagogy. This 120-minute exam tests YOUR knowledge of educational practices of ALL grades, kindergarten through grade 6. You KNOW that kindergarteners are much different than 6th graders! Yet this test expects you will know these things about EACH of the K-6 grade students you may meet: students as learners (22.5%); instructional process (22.5%); assessment (15%). The Praxis PLT K-6 also measures your knowledge of professional development, leadership and community (15%). There are 70 selected response questions and 4 constructed response questions. The ETS suggests using 70 minutes for selected response part and 50 minutes for the 4 constructed response questions. You’ll be given 2 case histories to read for the 4 constructed response questions. Your 4 written answers will count for 25% of the total score of your test. Here are some names and theories that could be on your test. Can YOU remember these names AND their theories? Bloom. Kohlberg. Bruner. Erikson. Watson. What about terminology of assessment tools? But how do you study for this high-stakes test? Listen to your peers. Practice the theories, the pacing in the selected-response AND the constructed response questions. Pass the first time by using the best Praxis PLT K-6 practice test and study guide for YOU! Praxis PLT K-6 Step #2: How Do I Take The Test? Take the test knowing you will pass. How? 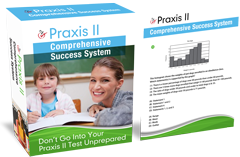 Use Praxis Principles of Learning and Teaching K-6 study guides and practice exams designed specifically to help YOU review the content AND learn how to take this high-stakes exam! There are so many Praxis Principles of Learning and Teaching K-6 practice tests and prep guides out there, how can YOU find the right ones? You have already completed the first step by finding out WHAT you need to study. Step Two: look for PLT K-6 study guides that will teach you what you DON’T know! Find Praxis Principles of Learning and Teaching K-6 prep books organized like the test: Students as Learners; Instructional Process; Assessment; Professional Development, Leadership and Community PLUS CASE STUDIES! Once you have the best study guides and practice tests, use them wisely to get a passing score the first time. The Praxis (5622) assesses your knowledge of pedagogy, but it also tests YOUR ABILITY TO TAKE TESTS. NOW is the time to use all of the scientific research on test-taking to pass YOUR Praxis PLT K-6! Wait to use your Praxis PLT K-6 Principles Of Learning And Teaching study guide and sample questions until the week of your test! Cram! The Praxis PLT K-6 covers too much material! Pass The Praxis Principles Of Teaching And Learning (PLT) K-6 And Look Forward To A Bright Future! The Praxis PLT K-6 Principles Of Learning And Teaching (5622) doesn’t have to stand in the way of YOUR goals! If you know what is on the test, what YOU need to study, and how to take the test, you are on your way to passing the the first time!